This exclusive residential community on the North Kona Coast with intimate enclaves of beachfront homes and golf course villas is located just north of the Kona International Airport. It’s a magical tropical oasis where every amenity – golf course to spa to restaurants – is close at hand. 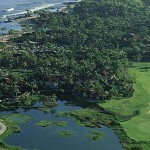 The AAA Five Diamond Four Seasons Resort Hualalai is located at Historic Kaupulehu. 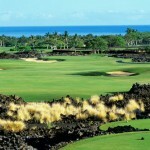 Golfers who stay at this resort hotel will enjoy the Jack Nicklaus designed Hualalai golf course. 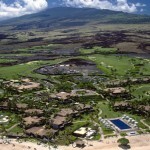 www.hualalairesort.com. Home of the PGA TOUR Champions Tour MasterCard Championship (January 18-20, 2008), the Jack Nicklaus Signature Hualālai Golf Course is designed with a sense of place. This carefully groomed course is a study in the artistry of golf course design and maintenance. The advantage is yours with a very extensive practice facility, nine-acre driving range with 27,000 square foot short game practice area and complimentary clinics with any of the pros. 18 holes. Par 72. Flights with one stop are available to Kona International Airport (KOA) from John F. Kennedy International Airport (JFK).